MS Football and the Cheapest Easiest Fastest Best Tasting Thin Crust Pizza Ever! 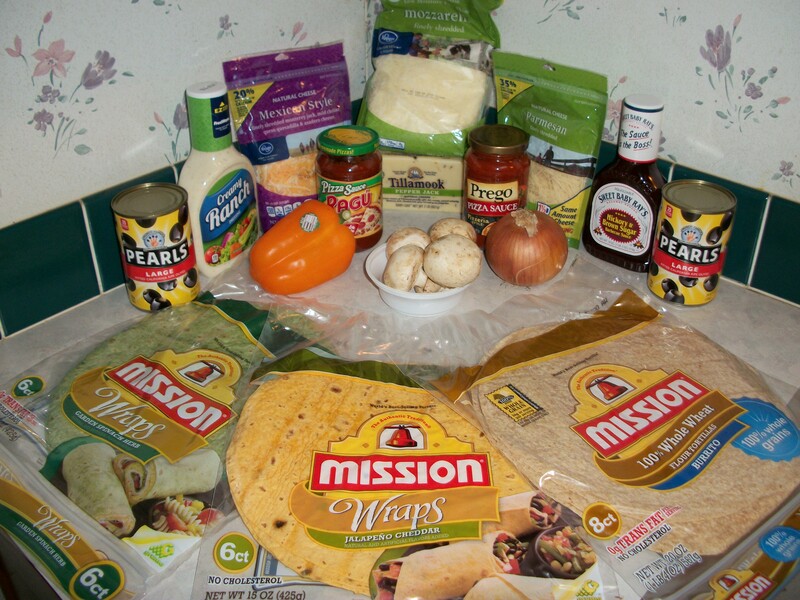 And the secret is to start by using any one of the many assorted Mission Tortilla Wraps as the crust. The larger wraps come in regular, 100% whole wheat, garden spinach herb, jalapeno cheddar, and there may be others that I’m not as yet aware of. Anyone of these larger wraps is absolutely perfect for creating a personal pan sized pizza. And add just a salad or a fruit or veggie side and one of these pizzas is usually enough for two. The following ideas are just a few of a multitude of ways that you can prepare these incredible pizzas for any occasion including as a football favorite. 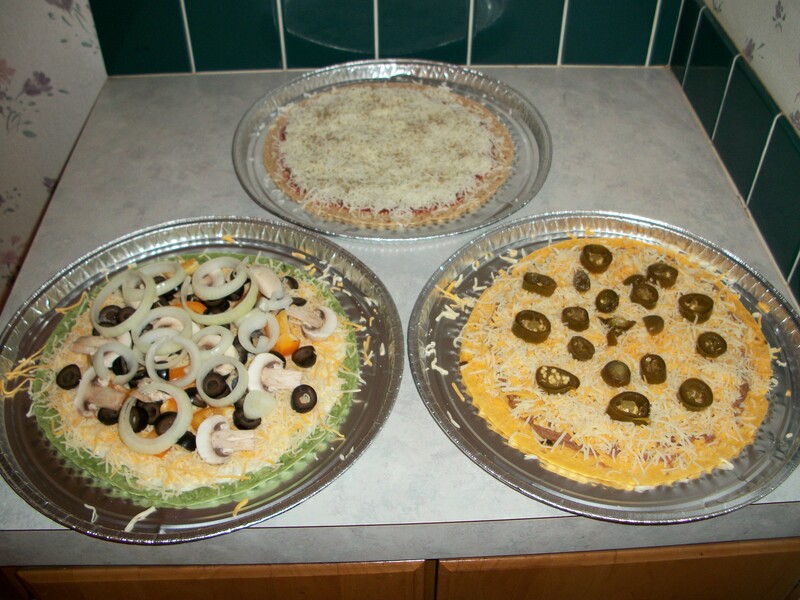 For your more traditional pizza you can start with either the regular wrap, or the whole wheat wrap as a healthier fiber filled crust laid out on a pizza pan or aluminum foil, and spread about a third of a cup, you can adjust to your own taste, of either your own homemade pizza sauce or any one of a number of store bought brands. I use Ragu pizza sauce as that tastes the best as far as I’m concerned. Then using a spoon spread the sauce as evenly as possible around the crust coming to with in about a half inch of the outer edge of the tortilla wrap. And then, just like a pizza place, sprinkle on your favorite kind of shredded cheese, for me its provolone, covering the sauce. Add any toppings that you like and bake in a preheated 350% oven, remember oven temperatures vary so keep an eye on it the first time, for about twelve minutes. And then for a change of pace you can also start with a garden herb wrap and instead of pizza sauce use about a third of a cup of ranch or blue cheese dressing, any brand will do, and spread around the same way as a regular pizza topped with your choice of shredded cheese or cheeses and topped with whatever toppings you like onions, mushrooms, green peppers you get the idea. I use this recipe quite often for vegetarian pizzas and it works great as a main course with a salad on the side. Another way of making one of these pizzas would be to start with a jalapeno cheddar wrap and spread out about a half cup of either warm precooked taco meat or warm refried beans spread out in the same way as you would with pizza sauce. In this kind of pizza I usually use sharp cheddar cheese, again use what you like as that’s the beauty of these you can do anything, and then top with jalapeno peppers for a spicy hot Mexican pizza you won’t soon for get. And then after cooking top with fresh salsa and/or cool sour cream. This one is very filling. Want more ideas? You can start with any flavor wrap and spread about a quarter cup of olive oil and then your favorite kind of cheese with sprinkled oregano leaves and or fresh garlic or garlic salt for a great white pizza. Another idea would be to use any wrap with about a third of a cup of BBQ sauce spread out just like above and topped with your choice of cheeses and either precooked pulled chicken or pork for an awesome BBQ pizza that is also great topped with cold coleslaw after it comes out of the oven. And yes, instead of BBQ sauce, use your own favorite Buffalo hot wing sauce with some blue cheese dressing on the side to help cool off your taste buds as the perfect football pizza party treat. Want to get your kids involved? These are fun quick pizzas to make where they can create exactly what they like and want to eat for special occasions. And these are just a few of the ideas that you can use, but be creative, even steak sauce with cheese and precooked steak make an incredible pizza that you can also either roll or wrap as a sandwich! And if you’re creative enough I bet you could even use a wheat wrap and come up with some outrageous dessert or breakfast pizzas of your own. In the weeks and months ahead let me know what you come up with and perhaps I’ll do a sequel to this article with your own creative Mission Tortilla Wrap recipes! This entry was posted in Uncategorized on September 29, 2015 by msandbeyond. I have no idea how I got on Yahoo News. I did not get a whole of hits from it but am glad to know that I’m there.